Wed. February 3, 2016: 8:00 PM EST- Learn everything you need to know about planning the perfect destination wedding with Romantic Planet Vacations' President and Certified Destination Wedding Specialist. This hour long presentation will include tips on how to select the right destination and resort, the 10-step process of planning a destination wedding, tips on how to work with your onsite wedding coordinator, and how to budget for that special day. RSVP today by clicking here. 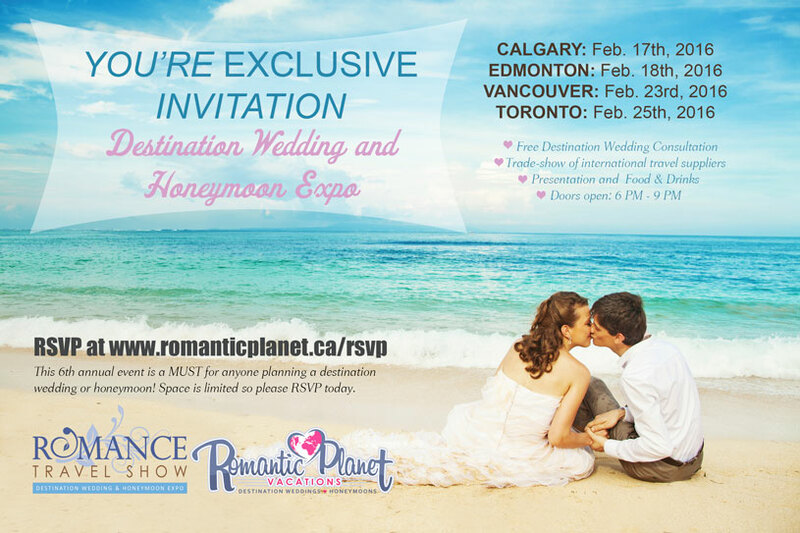 Romantic Planet Vacations Inc. is pleased to announce the dates for our 6th annual Romance Travel Show: Honeymoon and Destination Wedding Expo! Meet travel exhibitors from around the world who cater to honeymooners and destination wedding groups including hoteliers, onsite wedding coordinators, tour operators, tourism boards and more. The trade show is followed by a very valuable and informative presentation on how to plan a stress-free honeymoon & destination wedding. All attending brides and grooms -to be are entered to win a luxury TRIP FOR TWO!